Later inscripton: Ἀλφήος συν Ἀρεθῶνι (Gem of Alpheos and Arethon). Sardonyx. Late 1st century BCE. 2.5 × 2.1 cm. Saint Petersburg, The State Hermitage MuseumInv. No. Ж 273. Drusus the Elder and Antonia (?). 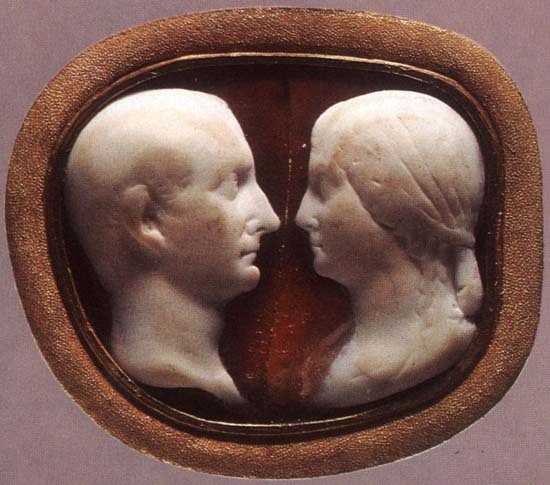 The cameo was preserved for a long time in one of the monasteries in the South of France as a Christian relic — the wedding ring of Mary and Joseph. Stefani, Putevoditel, str. 68; Maksimova, Reznye kamni, str. 99; Vystavka portreta, str. 31.